Finally came the dissolution of monasteries and Biggin came into the hands of Queen Elizabeth and degenerated into an ordinary farm, its conventional buildings being pulled down and most of its stonework, which is sure to have been of a very handsome character, was conveyed to Swanbourne, where it still remains, although it is believed that the foundations and part of the end of the "old workhouse" at Winslow which can still be seen were built with stone from Biggin. The adjacent fields, Winslow side of the brook are still known as "Biggin." In fact it is unlikely that there were ever any monks permanently resident at Biggin. The Cellarer stayed there on his biannual tour of the St Albans estate, but it was mainly used by the laymen who ran the manor on behalf of the Abbey. After dissolution in 1539 it became an enclosed farm, as can be seen on the 1599 map. There was a house of some sort there long after 1680. Below are extracts from some documents relating to Biggin. Above: Biggin earthworks photographed July 2016, looking south towards Granborough. 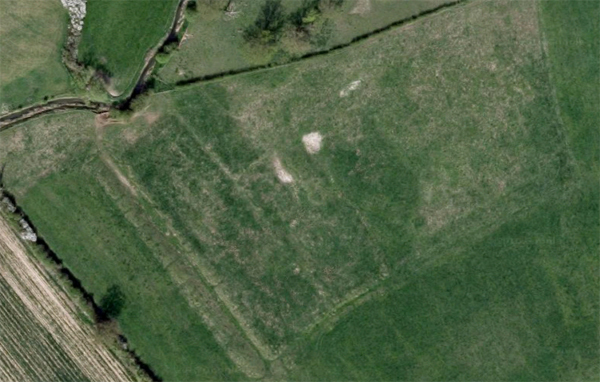 Below: Google Earth view of Biggin earthworks (north at top). 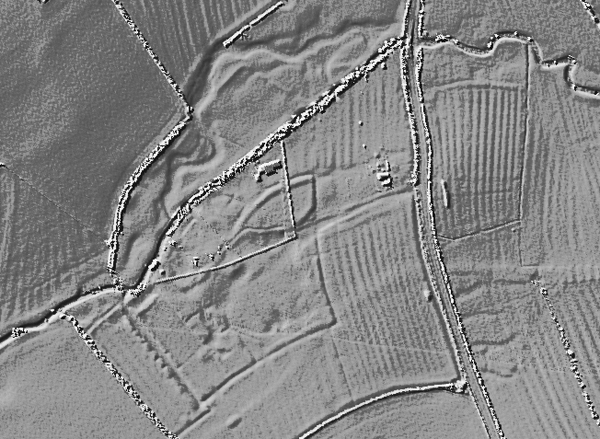 Below: Lidar view of the site. Granborough Bridge is near the top. Note how the brook has been artificially straightened between Biggin and the bridge. Confirmation of a demise for life, by chirograph, by the Abbot and Convent of St. Albans to Simon Fraunceys, citizen and mercer of London, at a yearly rent of £200 of the Manor of Biggynge, Co. Bucks, with the towns of Wyncelowe, Horwode, Schipton and Greneburgh, with rents, services and customs, view of frankpledge, etc., and the market of Wyncelowe, with the profits and fines therefrom accruing, the windmills of Wyncelowe, Horwode and Greneburgh, and all other appurtenances, except chattels of felons and fugitives, and execution and return of writs; and also of all rents belonging to the Abbot and Convent from Ovynge, Middleton Kaynes and Northmerston. Simon Fraunceys feels that a matter referred to the court under the Ash Tree at St Albans ".... is to the prejudice of himself and his status...."
"....the Lady of Kirkby, former farmer of Winslow, who had full authority as she said from Master Hugh, former Abbot of St Albans and the Monastery of that place to hold a halimiote in his name and receive surrenders of holdings and native lands from all the villeins of the manor...."
John Lombe sublets 2 acres in Ryefurlong ".... which Simon Fraunceys farmer previously devised to John from the Lord's land for the term which Simon had on them...."
Demesne land at Tuckey is said to be held ".... within the term which Simon Fraunceys has on the Manor of Winslow ...."
Simon Fraunceys appears to have died or given up his lease as there is reference to ".... the time of Simon Fraunceys farmer of the Manor ...."
Although there is no reference to another farmer of Biggin or of the Manor at this time, John le Chandeler a freeholder is to show his charter ".... on the following day at Byggyng...."
By this time there is again a tenant for ".... Robert Janyn farmer of the Manor of Byggyng...." appears. The Court is held at "Grenburgh Bygging". Lord Abbot granted to John Barry, gentleman, an annuity of 40s, with the livery of his gentlemen, of a length reaching to John's feet. To collect the annuity annually in the Manor of Biggmg in the County of Buckingham, during the Abbot's life, with power of distraint; as appears more fully in the indentured letters patent then sealed with the Lord Abbot's seal. In return for the annuity and livery, John relinquished to the Lord Abbot all his lands and leases which he had in the Manor of Bigging, to be rented for £7. Furthermore, John, by reason of the annuity and livery, was one of the Lord Abbot's council etc. Calendar of the patent rolls preserved in the Public Record Office--Philip and Mary, Vol. 3. 1555-1557, pp.406-7. co. Buckingham, formerly belonging to the monastery of St.
and the said rent of 10l. and Greneburgh belonging to the manor. advowsons (save that of Glymton). To hold as of the manor of Estgrenewich in free socage. This undated dispute from 1585-6 comes from the Court of Chancery. John Ardene said that in Jan. 1582 he conveyed his manor or farm of Biggyn to Thomas Lee, gent. (presumably as a mortgage arrangement). Thomas Lee then assigned it for 4 years from the following Michaelmas to Peter Dormer of Shipton Lee, Quainton, the brother-in-law of JA, as part of JA's marriage settlement. According to an indenture between PD and JA, PD would use the profits to pay JA's debts. JA said that the profits were more than sufficient to pay the debts, and PD allowed him to regain possession. PD also promised to pay JA 100 marks on his marriage. When PD died (in 1583, leaving a young son as his heir), his executor John Chester of Shipton Lee refused to honour the trust or render an account to JA, who asked for a writ of sub-poena against him, claiming that he and his wife and children were greatly impoverished. Read John Ardene's complaint. John Chester's answer stated that JA did convey his term (i.e. unexpired lease) on Byggen farm to Thomas Lee, who then assigned it to PD for 4 years, of which there was less than 1 year to run. JC was willing to render an account to JA, but did not believe that PD had a surplus from the profits with which to pay JA's debts, and said that PD had used 200 marks of his own money. JC thought JA intended to sell the produce of the farm on his own account. He said that PD promised 100 marks to his sister if she married with his consent, but he did not consent to her marriage to JA, and he would not have allowed JA to regain possession of the farm. Now JA was hiding in his house and not daring to show his face. Read John Chester's answer. There is not much information about the farm at Biggin, but there are references to arable land, corn, hay, horses, cows, pigs and wood. All that my Manor of Biggyn otherwise now known as Bury Farme with appurtenances situate standing and being in Wynsiowe and Granborough…. The property was sold with the manor of East Claydon to William Abell on 22 May 1624 (see documents listed in Lowndes Roll). This is the final concord made in the King's court at Westminster on the morrow of Trinity in the 4th year of the reign of King Charles before Thomas Richardson, Richard Hutton, Francis Hardye, George Croke & Henry Yelveston justices & other faithful subjects of the King there present between Emanuel Earl Sunderland querent [i.e. purchaser] and William Abell & Isabella his wife deforciants [i.e. sellers] concerning the manor of Biggyn with appurtenances and one messuage, one mill, one dovecote, one garden, one orchard, 400 acres of land, 100 acres of meadow, 250 acres of pasture & common of pasture for all beasts with appurtenances in Grandborowe alias Grandboroughe & Winslowe, about which a plea of covenant was summoned between them in the same court, namely that William & Isabella acknowledged the manor, land and common of pasture with appurtenances to be the right of the Earl, or what the Earl has as the gft of the same William and Isabella, and they remised and quitclaimed for themselves and their heirs to the Earl and his heirs forever. William & Isabella granted for themselves and William's heirs that they would guarantee to the Earl and his heirs the manor, holdings & common of pasture with appurtenances against William & Isabella & William's heirs forever. And for this acknowledgment, remission, quitclaim, guarantee, fine & concord the Earl gave to William & Isabella £700 sterling. [verso] According to the form of the statute. The first proclamation was made on 2 July in Trinity Term in the 4th year. The second proclamation was made on 21 November in Michaelmas Term. The third proclamation was made on 4 February in Hillary Term in the 4th year. The fourth proclamation was made on 29 April in Easter Term in the 4th year. NB The description and price given in Feet of Fines are not necessarily accurate; see the National Archives guide. The part of Biggin in Winslow was an enclosed freehold farm of 180 acres. Sunderland transferred ownership to his mistress Martha. See further below. 2. Francis Nicholson of Downeholme Parke in Richmondshire, Yorks, gent. and George Gardner of the Savoy in the Strand gent. The manor and advowson of Hambleden: of whom they are held the jurors do not know; they are worth p.a. in all revenues except reprises £10. The manor of Biggin alias Berry Fearme is held of the King as of his manor of East Greenewhich in free socage; it is worth p.a. in all revenues except reprises £10. The messuages, tenements and hereditaments in Hambleden and Grandborowe alias Grandborrough and Winslowe: of whom they are held the jurors do not know; they are worth p.a. in all revenues except reprises 20s. Herts RO ASA7/31, f.4 (19 March 1635/6): Stephen Janes of Granborough said that his predecessors had a special seat in Granborough church as "inhabitants of the farme called Biggen Farme", of which Richard Grace had deprived him. f.6 (2 April 1636): Richard Grace said the seat had long belonged to the possessor of Graces Ferme, not the Biggen Ferme. Enquiries continued for over a year, including a commission to the Vicars of Winslow and Little Horwood to sit at Winslow church so the witnesses did not have the expence of travelling to St Albans. f.55 (26 Sep 1637): according to his representative Nicholas Rolfe, "the said Richard Grace was and is the lawfull owner by right of enheritance or other good and lawfull right of the Farme house called Graces Farme with the lands thereunto belonginge wherein hee then dwelte and occupied and now dwelleth and occupieth" as previously stated "and that the said Stephen Janes is but Tenant Baylife or servant to the owner of the Farme called the Biggen Farme" as previously stated "and that all the lands belonginge to the said Biggen Farme are not in the occupacion of the saide Stephen Janes but att least three partes a moytie or the fourth or some other part of the saide lands are letten to some other person or persons whoe occupie and possesse the same and are taxed and doe paye for the same to the Repayre of the church and other Taxacions". Janes' representative Dagnall disagreed and the case was again postponed. f.62v (12 March 1637/8): Richard Grace presented letters inhibitory from the Court of Arches preventing the Archdeacon's court from reaching a verdict. A true and p(er)fect Inventory of all the goods & Chattels of Steven Janes late of Biggin Farme in the Parrish of Granborow in the Countie of Bucks gent taken the Nineteenth day of September 1638 in the Foureteenth yeare of the Raighne of our Sov(er)aighne Lorde Charles by the grace of God now King of England &c.
[Latin] This inventory was exhibited 15 Nov 1638 by John Jones. 1651: will of John Janes of Granborough (proved 1658); it's not clear if he was still living at Biggin; he mentions his sister Mary Foddergale. He was buried at Granborough on 12 Nov 1658. Wee whose names are subscribed Comissioners (amongst others) appointed for the taxing and assessing of ye first of the 2 Entire Subsidies granted to his Maty. by ye Layity in ye Parliament begun the 3d. day of No(vemb)er. in the 16th. yeare of his Maties Raigne  Doe Certify to ye Lo(rd) high Tre(asur)er to ye Lo(rd) chief Baron of ye Exchecqr and rest of the Barony there and to whom else these pr(ese)nts may concern That Mrs. Martha Janes was by ye Assessors of ye parrish of Granborough in com’ Bucks before us taxed and assessed att Five pounds in Lands for & towards ye payment of the said 2 Subsidies in respect of her Resiance and Comorancy at a place called Biggen Farme within yesaid parrish of Granborough at ye time of ye making of the said Assessmt wch said sum she ye said Mrs. Janes hath paid accordingly. Witnesse our hands & seals this 30th day of March 1641. [Added in Latin] Bucks, Three Hundreds of Ashenden. Grandbourrough: Martha Janes £5 in lands, £2 (payment). Note concerning the time of residence. Wee whose names are subscribed Comissioners (amongest others) appointed for the taxeing and assesseing of the two subsidies graunted to his Ma:tie by an Act of Parliamt made in the Parliamt. began the 3d day of November in the 16th year of his Mat:tiesRaigne intituled an Act for the further Releife of his Ma:ties Army and the Northerne p(ar)ts of his Kingdome doe Certifie to the Lord Treasurer and the Lord cheife Baron of the Exchequer and the rest of the Barons there and to all others to whom it may app(er)taine That Mrs. \Martha/ Janes – widdow was by the Assessors of the p(ar)ish of Granborough – taxed and Assessed at five Pounds in Landes for and towards the paymt. of those two subsidies as being Inhabitant and resiant in the s(ai)d p(ar)ish of Granborough where the s(ai)d Martha Janes did at the tyme of the s(ai)d taxacon and Long before most usually reside and inhabite wth. her Family and \is/ still there Comorant and abideinge. Wittnes our handes and seales this 18th of day of October 1641. [Added in Latin] Bucks, Three Hundreds of Ashenden. Grandborrowe: Mrs. Martha Janes £5 in lands, 40s (payment). Biggin Farme was included at the beginning of the list for Granborough with an assessment of £2 5s 6d. No individual was assessed at more than 11s 5d. In 1677, one Martha Jones, (alias Sandford), of Epperton [=Epperstone], Co. Notts, and others, conveyed to Sir Robert Clayton, Knight, Alderman of London, and John Norris, Esq., in consideration of £4,119 3s. 4d., the Manor and Farm called Bigyn, or Bury Farm, and lands in Grenesburgh and Winslowe. According to the VCH: "It is not clear how Bigging came again to the Lees, but it was held in 1624 by Sir Thomas Lee, kt., and sold by him in that year to William Abel, from whom it passed in 1628 to Emanuel Scrope, Earl of Sunderland (Feet of F. Bucks. Trin. 4 Chas. I [see above]). He held Hambleden Manor with which Bigging descended (Feet of F. Bucks. East. 28 Chas. II) until 1678, in which year it was conveyed to Sir Robert Clayton and John Morris (Feet of F. Bucks. Trin. 30 Chas. II.)." "Martha James alias Sandford, the mother of the earl's children, compounded for her estate in Grandborough in 1647 (Cal. Com. for Comp. 67)"
Emanuel Scrope, 1st Earl of Sunderland (1584-1630), the grandson of Henry Carey, Queen Elizabeth I's cousin, had four children by his servant Martha Jeanes alias Sandford. He must have given Biggin to her during his lifetime as she is not mentioned in his will (of which his wife Elizabeth Manners d.1654 was executrix). Presumably Stephen Janes was her relative. Winslow baptism records for 1626 missing. Was their son John born then? 1663 Subsidy: Mrs Martha Janes was the largest taxpayer in Winslow. This is the final concord made in the King's court at Westminster in the octaves of Candlemas in the 28th year of the reign of King Charles II before Francis North, John Archer, Hugh Wyndham, Robert [Atkyns?] & William Ellys justices & afterwards in fifteen days from Easter Day in the said year, granted & received & given before the same justices & other faithful subjects of the King then present there between John Savage esquire & Robert Hyde gentleman querents and Thomas Earl Rivers deforciant concerning the manor of Biggyn with appurtenances and one messuage, one mill, one dovecote, one garden, one orchard, 400 acres of land, 100 acres of meadow, 250 acres of pasture & common of pasture for all beasts with appurtenances in Grandborowe alias Grandboroughe & Winslowe, about which a plea of covenant was summoned between them in the same court, namely that the Earl acknowledged the manor, land, holdings & common of pasture with appurtenances to be the right of John, or what John & Robert have as the gift of the Earl, and he remised and quitclaimed for himself and his heirs to John & Robert & John's heirs forever. Furthermore the Earl granted for himself and his heirs that he would guarantee to John & Robert and John's heirs the manor, holdings & common of pasture with appurtenances against all men forever. And for this acknowledgment, remission, quitclaim, guarantee, fine & concord John & Robert gave to the Earl £700 sterling. The first proclamation was made on 8 May in Easter Term in the 28th year of the King. The second proclamation was made on 8 June in Trinity Term in the 28th year. The third proclamation was made on 9 November in Michaelmas Term in the 28th year. The fourth proclamation was made on 25 January in Hillary Term in the 28th year. This is the final concord made in the King's court at Westminster fifteen days from Easter in the 30th year of the reign of King Charles II before Francis North, John Archer, Hugh Wyndham, Robert Atkyns & William Scroggs justices and afterwards three weeks from Trinity granted & recorded before Francis North, John Archer, Hugh Wyndham, Robert Atkyns & Vere Bertie justices & other faithful subjects of the King then present there between Robert Clayton knight & John Morris esquire querents and Martha Jan[es ali]as Sandford, Thomas Earl Rivers, Thomas Savage esquire son & heir apparent of the Earl, Richard Savage esquire, John Savage esquire, Robert Hyde gentleman, Elizabeth Savage spinster, Charles Marquis of Winchester & John Grubham Howe esquire deforciants concerning the manor of Biggyn with appurtenances and one messuage, one mill, one dovecote, one garden, one orchard, 400 acres of land, 100 acres of meadow, 250 acres of pasture & common of pasture for all beasts with appurtenances in Grandborowe alias Grandboroughe & Winslowe, about which a plea of covenant was summoned between them in the same court, namely that Martha, the Earl, Thomas etc. acknowledged the manor, land, holdings & common of pasture with appurtenances to be the right of Robert Clayton, or what Robert & John Morris have as the gift of Martha, the Earl, Thomas, etc., and they remised and quitclaimed for themselves and their heirs to Robert Clayton & John Morris & Robert's heirs forever. Furthermore Martha granted for herself and her heirs that she would guarantee to Robert Clayton & John Morris & Robert's heirs the manor, holdings & common of pasture with appurtenances against Martha and her forever. Furthermore the Earl granted [similar clauses for all deforciants]. And for this acknowledgment, remission, quitclaim, guarantee, fine & concord Robert Clayton & John Morris gave to Martha etc. £600 sterling. The first proclamation was made on 19 June in Trinity Term in the 30th year of the King. The second proclamation was made on 15 November in Michaelmas Term in the 30th year. The third proclamation was made on 1 February in Hillary Term in the 31st year. The fourth proclamation was made on 7 May in Easter Term in the 31st year. Thomas Savage, 3rd Earl Rivers (1628-94), was married to Elizabeth, daughter of the Earl of Sunderland and Martha Janes. Thomas, Richard, John and Elizabeth Savage were presumably their children; Richard became 4th Earl Rivers. Charles Powlett, 6th Marquis of Winchester (1630-99, later 1st Duke of Bolton), was married to Mary, another daughter of Sunderland and Martha. John Grubham / Grobham Howe (1625-79) was married to their third daughter Annabella. Sir Robert Clayton (1629-1707), who was the Duke of Buckingham's trustee but seems to have been acting on his own account here, also acquired the manor of Hambleden from Sunderland's children between 1668 and 1686 (VCH Bucks vol.3). John Morris (d.1682) was his banking partner. Part of Biggin Farm appears under the name of the Berry Lands in a purchase by William Lowndes and William Gyles in 1680. It is clearly the same property in view of the documents cited concerning Sunderland, Rivers, etc. The Berry Lands were the 180 freehold acres in Winslow shown on the 1599 map, so later references to Biggin Farm must concern only the Granborough part of the property, which consisted of at least 84 acres (see the next entry). John Wise / Wyse who lent William Lowndes the money for the purchase regularly appears with Sir Robert Clayton as a co-defendant in Chancery cases, 1675-85. 1. Sir Robert Clayton, Alderman of the City of London, and John Morris of London esq. a moity of a Close of pasture in Grandborough called the Furze or Furzenry Close containing Fourscore acres, and a moity of four platts of meadow ground lying dispersedly in a common meadow called Sow Mead in Granborough containing together four acres, now or late in the occupation of Rich: Bampton, John Thorpe & Robt Stevens or their assignes, part or reputed part of a Farme called Biggen Farme. The indentures shall by voyd if Thorp pays unto Sydenham £212: on 26 May next £6, on 26 Nov 1679 £206 at the now dwelling house of Clayton and Morris scituate in the Old Jury in the parish of St Olaves Jury. [endorsed] Rob(er)t Thorpe & Rob(er)t Stevens Agreem(en)t for a division. Memd it is then Concluded & agreed upon by & betweene Rob(er)t Thorpe of Hardwicke & George Thorpe his son, & Rob(er)t Stevens of Grandborough & Elizabeth his wife, that whereas a Peece of pasture Ground in Grandborough called the Furzeney Ground contayning about Fourscore acres wherein the said p(ar)ties are sev(er)ally Interested & concerned which Ground by Agreem(en)t is to be devided The s(ai)d Rob(er)t Stevens for his part & on the behalfe of his s(ai)d wife doth hereby Covenant & agree to divide & sett out by Stakes & bounds the s(ai)d Pasture \ground/ as equally as he thinks \fitt/ on or before the 29th day of September next ensuing And when such division is made that it shall be att the Liberty of the s(ai)d Rob(er)t Thorpe & his son to choose w(hi)ch p(ar)t they shall thinke fitt paying five pounds for the \Choise thereof/ on or before the first day of November next And further that upon such division to be made the said Rob(er)t Stevens \is/ to sett forth & appoint the Mounds w(hi)ch shall belong to each p(ar)t, & the ditching & charge of bounding thereof to be borne & paid by such of the said p(er)sons to whom the p(ar)ts afores(ai)d shall upon the division afores(ai)d come & belong, And when such division shall be made & settled then all p(ar)ties concerned in Title & Interest are to make such assurance thereof each to other as by Councell shall be Advised which the s(ai)d Rob(er)t & George Thorpe doe agree to p(er)forme accordingly. And that they will make their Choise by the time afores(ai)d & pay the Five pounds upon such division & Choise to be made att such time as is herein before Agreed upon. In Wittnesse whereof the s(ai)d p(ar)ties to these p(re)sents have sett to their hands & seales the day & yeare first w(i)thin written. And now from Bed-Well- Head in Addington Feild I naturally make a transition to Biggin Farm in Grenburrow Feild: for ‘tis but from Superstition to Debauchery. A little below the Bridge which unites Winslow & Grenburrow Fields, near the River Side stood an antique Chapell, puill’d down about 30 years since, by the purchaser of the ground to mend their Ways, by corrupting their Doeings: By the Chapell, a large House, (more a small Sheep Barn.) In the large hall, on the Beame, over the Head, was engraved a Cross, to which the Parish Processioners paid Suit & Service on Rogation Monday: the Pater Familias treating the Minister & neibours with Cheesecake, Bread, Cheese, Beere &c. But this being lookt upon as a reliq of Popery, ‘tis abolisht with the Building. Alas! That Reformation should rise on the Ruins of Hospitality! And you will wonder with me in the Sequell of my Leter, why Grenburrow men sho’d be such zealous Protestants : for they certainly descended from Monks Bastards. Biggin House was formerly a Cell, Nursery, Retreat, or Infirmary to the Monks of St Alban’s. It had a little Mannor belonging to them within the Mannor of Winslow, now split [into two] Halves, [hav]ing so many Freeholders: most of whom from before the Reformation (as the Parish[?] Register can now witness) retein the Christian Name imposed upon them by their spirituall[?] Fathers in the Flesh: who, for the Honour of their Tutelar Saint, christened the Boys of their own getting by the Name of Benedict. George Thorp sr was buried at Granborough in 1745. 1736: Shelomith wife of John Dealey gent and daughter of Thomas Key of Biggin Farm gent died 1 Sept 1736. Buried at Launton, Oxon. 1705: Will of John Deverell of Swanbourne, yeoman. He leaves to his son John "all my Estate at Granborow & Winslow", which might be Biggin Farm. 1730: Inventory of John Deverell of Winslow, yeoman. There is no indication of where he lived, but he was later referred to as "of Biggen Farm" (see below), and he was buried at Granborough. According to Browne Willis (quoted by Clear, p.45), John Deverell of Swanbourne pulled down the chapel at Biggin "after the restoration of King Charles II". Leaves to his wife Elizabeth for her life, then to his son Richard: "All that my Inclosed Close of pasture Ground Scituate in the parish of Grandborough aforesaid called Jeanes’s Ground with the Appurtenances which I Formerly purchased of John Deverell"
Leaves to his son Robert: "All that my Inclosed Close of pasture Ground in the parish of Grandborough aforesaid called the Furzen Close now divided into two Closes and four individual plotts of Meadow Ground lying in Sow Meade in the parish of Grandborough"
1766: William Butcher of Steeple Claydon mortgaged to James Burnham of Winslow for £40: "All that Close of Pasture Ground formerly called or known by the Name of Walkers Close lying and being in the Parish of Grandborough in the said County of Buckingham containing by estimation two Acres be the same more or less then late in the tenure or occupation of Robert Stevens his Assignee or Assigns formerly part of a Farm called Biggin Farm" (see Administration of Richard Shelton). 1776: William Butcher and Rebecca his wife sold Walkers Close to Philip Box of Buckingham, draper, for £60. (see Administration of Richard Shelton). By 1805 the land had passed to Matthew Deverell of Salden. 1779: The mortgage of Bridge Ground was transferred to Richard Shelton of Winslow, currier, in trust for Mary Smith of East Claydon, spinster (see Administration of Richard Shelton). Two rich fertile PASTURE and MEADOW GROUNDS (adjoining) in the Parishes of WINSLOW and GRANDBOROUGH, about a mile from Winslow, on the Buckingham Road, known by the name of BIGGAN-FARM - Biggan House and other Buildings standing thereon; - with the Manor or Reputed Manor. - There are several thriving Trees growing on the same, with a Fishery running through the Meadow Part. The Whole containing about Forty Acres; in the Occupation of Mr Stephen Gibbs, Tenant at Will, at an old Rent of 55l per Annum. "I give and devise unto my housekeeper Mary Bradbury ... all those my several Freehold inclosed grounds called or known by the Name of Biggin Farm ground"
1807: Will of William Selby (heretofore called William Lowndes) of Winslow directs executors to sell "all my farm lands tenements and hereditaments situate in Granborough in the said County of Bucks called Biggin Farm now in the occupation of Francis Budd". Left all her real estate (unspecified) to her brother Robert and nephew John Bradbury. 1820: John Chapman of Whaddon acquired the freehold of Bridge Ground (see Administration of Richard Shelton). A Desirable SITUATION, at WINSLOW, in the County of Buckingham; consisting of a good dwelling House, with a large Yard, good Garden, Stabling, Barns, Piggeries, and other convenient Premises; together with about five Acres of good pasture Land, divided into two Closes, now in the Occupation of Mr. Francis Budd, who is leaving the same at Michaelmas next, when Possession will be given. For a View of the Premises, apply to the TENANT; and for further Particulars, to Mr. RICHARDSON, of Thornborough Mill; or to Mr. EDWARD CLEAVER, Draper, at Newport Pagnell. 1825: Biggin Farm in Winslow and Holcombe Farm in Swanbourne, "then late or theretofore were in the tenure or occupation of Thomas Read his Undertenant or Undertenants assignee or assigns at and under a yearly rent of Two hundred and sixty Pounds" were settled in trust by William Selby Lowndes and his sister Maria Selby Lowndes to William Lowndes Stone. BIGGEN FARM, consisting of 35a. 2r. 2p., of first-rate Pasture and Meadow Land, adjoining the Road to Grandborough, in the occupation of Mr. George Maydon. The Manor of Winslow, with its members, Little Horwood and Granborough, continued parcel of the demesnes of St. Albans Abbey until the general dissolution of religious houses the time of Henry VIII, when it was surrendered to the Crown, in whose hands it remained until 1599, when Queen Elizabeth sold it to Sir John Fortescue, of Salden, for £2,329 7 1. A few years prior to this, viz 1586 - the Crown had granted to John Fortescue, in consideration of a tine of £6 13 4, a lease for 21 years at the annual rent of £1 13 4, - of the Office of Bailiff and Clerk of the Market of Winslow; and all waifs and strays, in right of the Manor of Biggin, near Winslow; with all stallage, piccage, tolnage, customs, rights, jurisdictions, etc., of the Forester in the Woods of Little Horwood. In 1619 the Manor was sold to Sir George Villiers, Marquis of Buckingham; it was purchased in 1697 under an act of Parliament, (giving power to Nicholas Goodwyn the Mortgagee, to sell it), by "William Lowndes, Esq., in whose family it still continues. The Manor of Biggin, was situate in Granborough, and the Abbey of St. Albans had long held a Grange or Farm there, with a Cell and Chapel, of which nothing now remains. But the extensive entrenchments and marks of the foundations may still be traced in a field near the present Granborough Bridge. The Church at Granborough was formerly a Chapel of Ease to Winslow, and Lipscombe, before quoted, mentions the existence of an old Deed or Roll, dated about 1250, in which Aston Abbotts is also called a Chapel under Winslow, it is therefore probable that the officiating Priests for these places, were supplied from the Cell at Biggin. In Grandborough Church there is carefully preserved a carved marble representation of the crucifixion, with a figure on each side of the Cross, this is believed to have been originally in the Chapel at Biggin, the buildings were still standing until about 1680, a family named Sanford being the last residents, the place was then mostly pulled down by John Deverell of Swanbourne, and the materials sold, and tradition has it that part of the same were used in repairing the Moat House at Little Horwood.